The bees needed more food. 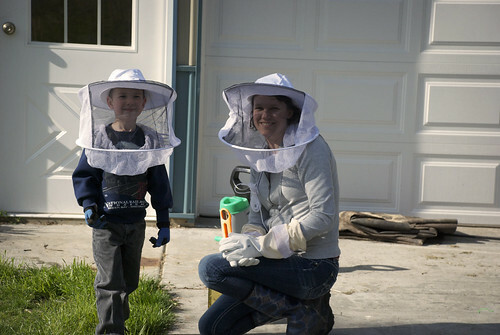 Both hives had gone through a quart of syrup already, so we gave them both a refill. Walter was a great helper! He was happy to put on a veil and gloves and he calmly looked around, asking questions the whole time. 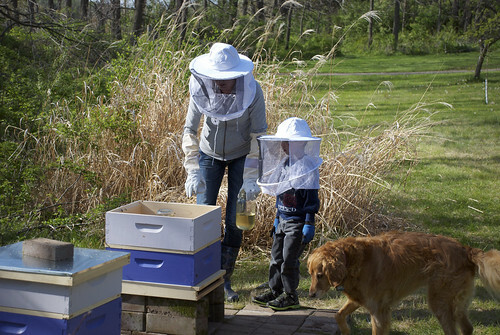 I love that he's so interested and able to keep his cool around all those bees. Molly is doing great with them too. So far she's more interested in the jar of syrup than the bees.